The season of Lent takes place on the Christian calendar for forty days before Easter. Lent is defined as a time of fasting and penitence in preparation for Easter. In this day and age both fasting and penitence may seem peculiar. And yet during this season of Lent – when the earth is still barren from winter – our lives too may seem on hold, waiting for a miracle. It’s a time when I become deeply aware of the suffering in the congregation, the community, the world. On any given day we all look pretty much all right, but beneath the appearances many struggle. It’s a time when I revisit the sorrows I have caused others. Old memories that hide from summer’s sun and spring’s brilliant colors and the excitement of fall activities – these make themselves known during this fallow time of the year. It’s a time when “doing without” seems the appropriate way to nourish our spirituality. As the earth still is “doing without,” as we reach the end of our store of energy and spirit that was gathered and packed away during the harvest. Now we do without and await a word of hope – the promise of a future. Religious liberals sometimes are accused of wanting Easter without Lent or Good Friday. Given our attitude of hope and affirmation, we may skip past the struggles that give birth to new life. But I have not found that to be true. Suffering and struggle come to us, whether there is room for it in our theology or not. The faith that speaks to this experience is not specifically Christian but universal – that there is meaning in our struggles, that we may be transformed in our suffering. That Easter awaits beyond the barrenness of this season of Lent." Last Friday evening I attended an event with some friends in Northwich, a part of Cheshire I am unfamiliar with. We travelled there and back being guided by Sat Nav, trusting the voice of the lady in the machine. It is amazing how reliant on technology I have become, I know I am not alone in this. On the way back home there were many diversions, which the machine couldn’t quite cope with. The voice in the machine kept trying to get me to go one way, but I had to ignore it and basically trust my instincts. I did eventually find my way back to Altrincham, although it took a lot longer than it should have. We made the most of it, we told many stories of our lives and enjoyed a lot of fun driving in the dark in unfamiliar territory. I know that this time in the wilderness brought the three of us closer together. I have driven both of these friends to numerous events over the last few years and it is usually quite a fun adventure. One in particular always brings a smile to my face when I think of the crazy conversations we have had. She is as stubborn and belligerent as I can be. I recall a conversation we had this time last year when she was complaining about the cold. I remember at the time saying “Well it is winter” to which she said “that it wasn’t, winter is November December and January but spring begins in February.” I spent a little time explaining when winter is meant to be and the four seasons in general, but she wasn’t having any of it. Our conversations often go like this. A few days later she finally relented after scouring the internet obsessively in an attempt to prove me wrong. I have lost count of the number of similar conversations we have had over the last few years. 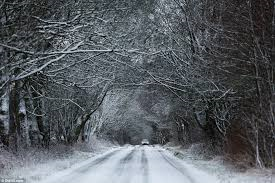 It is now March and we have stepped into the season of Lent, but we are still experiencing wintery weather. It even snowed this week. There have been some signs of spring these last few weeks but it is not quite here yet. I know most of us want winter over and the new life of spring. We want Easter and the re-birth of spring to come oh so soon, but first we have to travel through the barren wilderness of March and Lent. Soon though the new life will be here, we will soon be enjoying that gorgeous pink snow that comes with the cherry blossom, the new life will soon be with us. We have entered the season of Lent. I hope you all enjoyed your pancakes on Tuesday. On what some still call Shrove Tuesday, or as many prefer to call it “Pancake Day”, or as I prefer to call it “Flat Yorkshire Pudding Day”…How do you eat yours? The following day “Ash Wednesday”, for Christians, marks the beginning of 40 days of fasting, reflection, penitence and self-sacrifice that lead up to Easter, the day of re-birth re-newal and new beginnings. Lent is a time of reflection, a time of temptation, a time to observe and find answers. It’s a time of preparation. These forty days or so are meant to be a barren time, where we strip ourselves down of luxuries and distractions to give birth to new treasures that can be symbolically born again at Easter time. Not an easy time and a time to experience a sense of loneliness as we enter our the inner wilderness. In the account found in Matthews Gospel, Jesus is “led by the spirit” into the wilderness, a place of transformation and temptation. He is taken to the pinnacle of the temple and to the top of a high mountain. Here he is offered the world, but rejects the allure of an easier celebrated more obvious path. Instead he chooses the road less travelled, the heroes path. He is tempted by “Satan” but resists the temptation. This is a universal tale; many of the great sages went on similar journeys, before embarking on their missions to heal their people. The Buddha had to leave the comforts of home, abandon his weeping family, shave his head and don the robes of a world renouncing ascetic, when he began his journey to discover a cure for the pain of the world. Long before his revelations Muhammad would retreat to Mount Hira, outside of Mecca, where he fasted, performed spiritual exercises and gave alms to the poor. He did this in an attempt to discover a remedy for the troubles of his time. When Ghandi began his mission he left the comforts of the elite in which he had lived his whole life and travelled to India carefully observing the plight of the ordinary people. During their times in the wilderness the great sages found their answers. Through taking the road less travelled, the hard road, the difficult road, the answers came to them. They discovered the knowledge they needed to impact positively on their people in their time and place. This is the spiritual life in its essence. It is often the hardest most difficult path and it can certainly appear to be the loneliest, one filled with temptations. That said it is the one where the answers are usually found. Lent is not just about giving up luxuries whether that be food and drink. or as I have seen with some friends and colleagues giving up their dependence on technology. I know several people who have come of social media and one collegue who has said he has given up “plastic” for Lent. 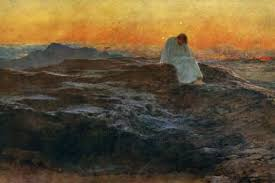 Lent is also a time of reflection a time to go inward and search out answers to the troubles we face as individuals, families, communities, nations and the world. It is a time for repentance and for re-building relationships with those we share this world with. Lent shares this focus on repentance with many other religions. It shares a focus on atonement with Yom Kippur the Jewish New Year where prayer and fasting accompany acts of atonement. There are parallels with Ramadan in the Islamic tradition, a time for fasting and spiritual engagement as well charitable works and act acts of atonement. Both have a key focus on putting right relationships with God and the people around us. You see similar rituals in both Hinduism and Buddhism too, where fasting atonement, forgiveness and reconciliation are key components. You can see clearly two key components in all the traditions that is at the core of Lent. One being fasting, denying oneself of life’s luxuries and therefore connecting with those less fortunate and the other healing relationships with one another and with whatever we believe is at the core of all life. It is a time to go inward, but with a sense of purpose. The purpose being to return outward with the intention of bringing healing to our shared world. Lent is not an easy path. If only we could simply see what the problem is and change what needs to be changed. Life holds many distractions both internal and external. Lent recognises this, it is part of the mythos. In the Gospel accounts Jesus is tempted from his path by Satan. Satan means “the hinderer”. Temptation can be understood as anyone or anything that hinders our attempts to live the lives we are choosing. It hinders us from seeing who we truly are, children of life, children of love, children of God as it does the same with those we share this world with. Temptation is that force that separates us from ourselves, from one another and from all life. A force that seems to be growing in power in our time and place. We do seem to be living in ever more dividing times. Walls are being built, peoples are being separated and scapegoats are being named. I see this in the people I share my life with and I see it on a local and global scale too. Lent to me seems like an antidote to this. We need Lent more than we have ever needed it. We need time to slow down and to reflect on our own lives and those who we share our lives with. We need to look inwardly and face our own troubles, to see what can be improved in our own lives. We also though need to look outwardly at the world in which we live and breathe and share our being. We need to see where the barriers are in our lives and those close at hand and we need to bring atonement both to our inner and outer lives. It is so needed. We need to take this time so that we can begin to bring some healing to our suffering world. As Jesus did and as the great sages throughout human history have done. We can follow their example, we do not need to be diverted by “the hinderers” both within and without. Lent is an opportunity to prepare for a new beginning, a fresh start. The cold winter is coming to end, spring is coming, new birth and new life is coming. We need to prepare ourselves for this. 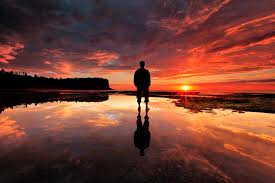 We need to go inwards and reflect in this time to face our own demons, our distractions, the things that hinder us. 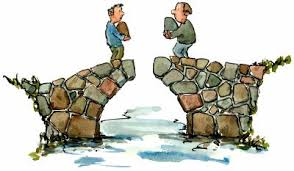 We then need to turn outward to our world and begin to build bridges in our time and space. To me this is the message of Lent and of Easter that is to follow. It will not be pain free, there will be personal suffering, as there is in all life. Remember before we have Easter comes the horror of Good Friday. This is the example I see powerfully in the life of Jesus and the other great sages too, but particularly Jesus. His ministry was at its core about bringing love and reconciliation to humanity. This is the heart of his life and death and the love that lived on from his death, a love still alive today. If we look for it, we will find it. We can follow this great example we can bring this love alive. We are responsible for our lives and our world. Are we going to be “the hinderers” to this love, the wall builders or are we going to be the ones who bring this love alive, the bridge builders. Lent is about attempting to practise love in life day by day, despite the distraction both within and without. It’s not about giving up sweets or chocolate or plastic or neon, it’s about giving of ourselves to life each and every day in whatever small ways that we can. It’s about building bridges of reconciliation rather than walls of separation, it’s about facing up to our demons, those within and those without and about attempting to build the commonwealth of love right here, right now.